First it was EarthWare Face and Body products, then a move to Cranbrook and finally a move to Yahk where Tammy Bessant bought the Yahk Soap and Candle Company along with Two Scoop Steve ice cream parlor. “I have been making and selling things since I was a teenager,” said Bessant. Twelve years ago she created EarthWare to make and sell 100% natural skin care products. Three years ago she and her husband moved to Cranbrook where Bessant started selling EarthWare products to local shops and at farmers markets. While looking around the area for “good business opportunities,” they came across the town of Yahk and the Soap company. They immediately knew this was the place for them, so they bought the property and in May 2017 opened the soap shop which stocks the full range of EarthWare products. The shop also carries numerous gifts all handmade by local artisans. At the same time, they re-opened Two Scoop Steve, a legendary ice cream shop where locals and tourists stop to rest and refresh after a busy day. Bessant’s business philosophy is all about establishing mutual support among local businesses, artisans and vendors. “Follow your instincts and support each other. Collaboration with other local businesses, its something we feel strongly about. When one person succeeds we all succeed, its good for everybody,” she said. After renovating the cafe space, which is part of the Two Scoop Steve building, Team Bessant is opening the Yahk Mountain Cafe. The Grand Opening is today at 11am. Serving homemade soups and sandwiches made from scratch, the Cafe is an exciting new venture. “We’ll start small and grow as needed,” said Bessant. They will use local food producers. All of the meat and produce, when the latter is available, comes from the Creston and Kootenay area. This opening weekend the soup de jour is “cream of asparagus” soup with the asparagus grown in Creston. The featured sandwich is a pastrami or ham Reuben with a twist. Also on the grand opening menu, strawberry buttermilk muffins. Mmmm delicious!!!! The Cafe is using “William Tell cider” in the dressings. The bread, muffins and other sweet treats are all homemade. You can also enjoy great coffee, lattes and espressos. And, don’t forget the ice cream. Lots of different flavored ice cream, a cool treat on a hot summer day. Now that she’s running three businesses, “The reports at end of the day are perfect.” They help keep track of the sales and inventory details for each operation. 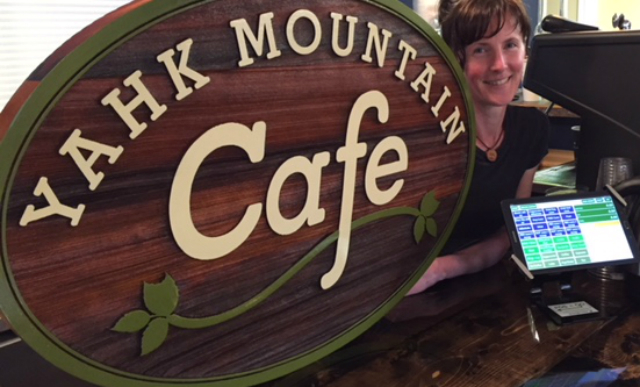 Located just off Highway 3 in Yahk, BC, stop in at the Yahk Mountain Cafe and Two Scoop Steve, open daily from 11am to 7pm. The Soap shop is open 10am to 5pm.